What is S. Korea doing to combat fine dust pollution? South Korea’s Special Act on the Reduction and Management of Fine Dust went into effect across the country Friday to tackle fine dust pollution amid growing concerns over public health. This comes as Korea grapples with massive air pollution; it ranked bottom in air quality among 35 member states of the Organization for Economic Cooperation and Development. The government is working on a range of measures -- including artificial rain -- which center on cutting emissions produced domestically and reducing the public’s exposure to fine dust, though the dust is believed to originate mostly from other counties, including China. The new act focuses on the government’s role in creating a control tower, devising a comprehensive plan to reduce fine dust pollution every five years, and protecting public health from fine dust. In accordance with the act, the government has created a countermeasure committee, comprising ministers and civilian experts, under Prime Minister Lee Nak-yon to take charge of fine dust-related policies. The act has also laid the groundwork for municipalities to enforce anti-pollution emergency reduction measures -- affecting both public and private sectors -- that come into force when average ultrafine dust concentrations exceed or are forecast to exceed certain levels. Emergency reduction measures come into force between 9 a.m. and 6 p.m. the day after the average concentration of PM2.5 exceeds 50 micrograms per cubic meter and is forecast to surpass the level for the next 24 hours. The measures could also be taken when advisory alerts for ultrafine dust are issued and the dust concentration for the next day is expected to exceed 50 micrograms per cubic meter. PM2.5 refers to ultrafine particulate matter less than 2.5 micrometers in diameter, while PM10 is fine dust of 2.5 to 10 micrometers in diameter. Most recently, emergency reduction measures took effect in Seoul in mid-January, when most of the country suffered high levels of fine particulate pollution for several days straight. Under such measures, city or provincial governments can ban old diesel cars from streets and ask emissions facilities to reduce their operating hours. They can also recommend the temporary closure or reduction of class hours at day care centers, kindergartens and schools, and ask companies to allow their employees to work flexible hours or from home. Those who violate the rules could face a fine of 100,000 won ($89) to 2 million won. Seoul was the first to enforce its own ordinance in line with the government’s drive. 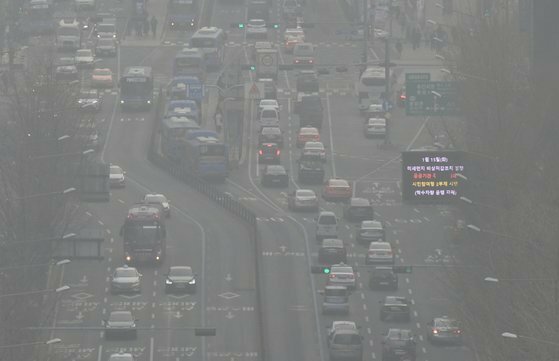 Under Seoul city’s ordinance, old diesel vehicles not equipped with emission reduction devices are restricted from driving in the capital between 6 a.m. and 9 p.m. the day after the emergency measures take effect. Some 400,000 cars are expected to be affected. The rule will not apply to old diesel cars smaller than 2.5 tons or registered to municipalities other than Seoul, Incheon and Geyonggi Province, until May 31. Starting from June 1, 2.45 million aged cars will be affected. Under the anti-pollution measures, parking lots at state-run organizations are shut down. Only half of public servants and those working for state-run organizations are allowed to drive, depending on whether they have odd- or even-numbered car license plates. The Seoul city government also seeks to install air purifiers in public buses, subways and subway stations. Some 67 percent of the buses now have fine dust filters, with all buses to be equipped by the end of 2019. In addition to 200 subway carriages with dust filters, the city government plans to install filters on 100 more carriages this year. China has denied responsibility for fine dust over the Korean Peninsula, which South Korea has refuted. The two countries have held a series of ministerial- and working-level talks to boost cooperation to resolve the fine dust problem in the region. The South Korea-China Environmental Cooperation Center opened in Beijing in June, and meetings of a South Korea-China joint committee on environmental cooperation are being held regularly. Together with China and other neighboring countries, the North-East Asia Clean Air Partnership, a joint cooperation mechanism to reduce air pollution in the Northeast Asia region, was also launched last year. After a series of meetings last month, the countries agreed to establish a joint early warning system for fine dust. They also agreed to expand the scope of their joint research on the cause of air pollution in China. More detailed plans to combat air pollution in the region will be discussed starting next month at working-level consultations. The plans are to be announced in the second half of the year during a meeting of environment ministers from Korea, China and Japan.